Accoring to the China Car Times, a Nissan GT-R hit a BYD e6 electric taxi. The report says the GT-R passengers were only minorly injured, while the three ocupants of the electric taxi were killed. It is not known if the accident, or the subsequent fire caused the deaths. Three people are dead after a Nissan GT-R sports car collided with a BYD e6 electric taxi and proceeded to burst into flames. Shenzhen police have said that the driver of the Nissan GT-R was heavily intoxicated and possibly drag racing. Witnesses claim that the Nissan GT-R was traveling in excess of 200km/h at the time of the accident. Early reports claim that the occupants of the GT-R were only slightly injured but the high speed impact into the e6 triggered spontaneous combustion of the electric vehicle and the death of all three of its occupants. So remember, if you have to pick a vehicle to be in, so you don't die, pick a GT-R over an electric car, made in China. I wonder how many people have to die in China, before they consider the vehicle to be dangerous. Although in excess of 200km/hr is about 120 mph. Which is pretty fast. However, the people in the GT-R did only have minor injuries, at least that is what the story says. According to Wikipedia, these are coming to the US in 2011. Wait a second, just checked the calendar, its nearly June 2012. In 2009 BYD indicated the e6 would be available in the United States in 2010 at a price just over US$40,000, and planned a rollout beginning in Southern California followed by several American cities. On October 2010 BYD announced that it was delaying its plans and U.S. sales were re-scheduled to 2011. On December 2010 the carmaker announced plans to ship as many as 50 BYD e6 electric cars by the end of 2011 to fleet customers in Southern California, including the municipal government of Los Angeles. BYD plans to sell the e6 model in the U.S. for US$35,000 before any government incentives. 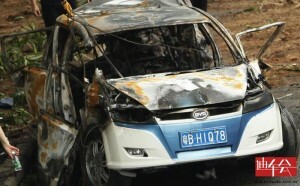 One of the biggest obstacles will be passing US crash testing, something which BYD plans to complete in 2011. As of August 2011, sales were scheduled to begin in the second quarter of 2012. However, in October 2011 BYD opened its headquarters in Los Angeles, a year behind schedule, and announced that retail sales will be delayed at least for 18 months due to the lack of charging infrastructure. Some commentators have noted that BYD has yet to bring a single all-electric car to the American consumer market and has repeatedly missed launch deadlines, giving rise to speculation about BYD's labor-intensive process of cell production's capability of achieving the uniformity of quality required for electric car batteries. In 2010 the City of Los Angeles agreed to purchase 10 e6 electric cars and lease a further 20. City officials also intend to start a pilot program running five of BYD's K9 electric buses.